As the runners’ feet pound the pavement, Phuong Nguyen captures each stride and every ounce of effort in the race. Aug. 10, 2016 11:00 a.m.
As the runners’ feet pound the pavement along the stretch of Highway 16, up ahead a photographer captures each stride and every ounce of effort in the race. When the Seafest or Riverboat Days parades pass through the streets, the photographer is there with several cameras strapped over his shoulder, cap on backwards, as he shoots every wave from the passing floats. Whether the event is big or small on the North Coast, Phuong Nguyen is there and he’s hard to miss. He’s right in the moment with his cameras, either lying down, crouching low or moving right up to his subject. “When I was young, it started then. My dad was very busy at work, and when he wasn’t busy he’d bring all the kids in the van and take the kids fishing, and he’d take pictures. I followed him,” Nguyen said. He grew up in South Vietnam with five brothers and seven sisters on a farm that harvested coconuts, rice and bananas. When communism divided the country, and more than 50,000 people fled to resettle in Canada between 1979 and 1980, his sister immigrated to Prince Rupert. She opened a restaurant and worked hard to sponsor nine of her family members to find a new life in Canada in 1991, including Nguyen. Nguyen felt welcome in the coastal city and in 1996 he went back to Vietnam, married his wife, and together they returned to Prince Rupert and started a family. Nguyen was working at his sister’s restaurant but chose the life of a crab fisherman to better support his family after he and his wife had two children. Photography became a part of his life in the city when he noticed the old photos on the wall in the Rupert Square Shopping Centre on the first floor of the building. “Every time I go in there, I don’t know why but it stops me because I love old photos,” he said explaining that is why he takes photos of people in Seafest, to capture the moment in time for everyone. But four years ago, Nguyen’s wife suddenly passed away. He is now raising his two children alone. “I was very sad, but nothing to do, I had to do something. Every day I go to take a picture of the eagles. Every picture I have tells a story,” he said. On days when there are events, he’s like a child unable to sleep before Christmas Day. He keeps a close eye on the newspaper and records in his calendar when the event takes places. At the event he sets up early, with his Nikon D800, Nikon D7000, Canon XL2 camcorder, and 10 64GB micro SD memory cards. He doesn’t want to miss one iota of a moment. “I do it for free because some people don’t have a camera and some people have a big camera but they’re shy. For me I’m not shy. I follow them. Sometimes I lie down. Some people are shy and they can’t take those photos. (When I do it) it makes them smile and my heart feels better,” Phuong said. After an event, he goes home and uploads all his photos to edit in Photoshop, then he posts some of his best images on Facebook where anyone has access. He loves covering races because his subjects are too busy running to record their efforts, and it’s not as though the runners are in a large city where photographers take photos along the route and sell them to the participants later. Wildlife is his other favourite subject to photograph. He spends hours in the harbour waiting for the eagles to become familiar with him so he can get close enough for a photo. He also said he can’t count how many times he’s been on the Prince Rupert Adventure Tours, in the Khutzeymateen grizzly bear sanctuary or whale watching. 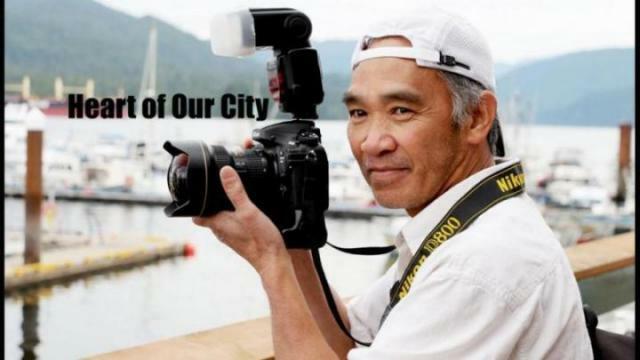 The hours Nguyen spends viewing the world through a lens brings him happiness as he documents the memories of Prince Rupert and its residents. He isn’t looking for money or social media fame — he only wants a smile. Maybe one day his photos will be framed on the walls of a public building offering glimpses of the past.